Whale Watching is one of those things you have to do at least once in your life. We were super lucky these September school holidays to make it up to Hervey Bay for a family holiday and a chance to see the amazing humpback whales in real life!! One of the exciting things about whale watching in Hervey Bay is that it has earned a reputation as the best spot in Australia, if not the world, to go whale watching because of the guaranteed sightings and frequent up-close encounters with whales in the wild. In the weeks leading up to our trip both Miss 7 and Miss 4 were beside themselves with excitement and waking up every morning asking if today was the day we were going to see the whales. Miss 7 did come home from school one day and said she didn’t want to see the whales anymore because her best friend told her they are “very big” and “they will knock the boat over and you will fall out of the boat and be eaten by the whales” lol. After a little conversation and some reassurance, Miss 7 realised her friend was just making that up and she was once again very excited to go and see the whales. We took a family road trip up to Hervey Bay (you can read about that here) to go and see the whales. The day before our planned whale watching trip we stopped off at the Fraser Coast Discovery Sphere. IT WAS FANTASTIC!!! The kids had a great time at the Discovery Sphere and learnt lots of different facts about whales and sea creatures that call the Great Sandy Straits Marine Park home. Did you know that the number of whales coming into Hervey Bay has increased significantly but steadily since the mid 90s?Back in 1992 when research first started in the region, it was believed there were 2,000 whales making the migratory trek from Antarctica. Now it is anticipated almost 17,000 will make the round-trip north. Of those, almost 7,000 whales detour into Hervey Bay and spend up to an average of 10 days in the calm, protected waters – what’s more, many of the same whales return year after year! The Fraser Coast tourism office also has a school based “Junior Whale Whisperer” program to teach kids all about whales and what makes the region so special. Our children spent two days colouring in and reading the fact sheets and activity sheets which was a great lead up to seeing the whales in the flesh. You can download a free copy of the fact sheet HERE and the activity sheet HERE to help keep those kidlets entertained over the school holidays! There’s also a bunch of other activity sheets from the Fraser Coast Discovery Sphere HERE. The kids were up bright and early on the day of our whale watching adventure with Spirit of Hervey Bay and were busting with excitement!! We found the spirit was a great family friendly boat. There were 5 decks in total and the kids particularly loved the underwater viewing deck where they could see under the boat. We felt safe on the boat with the 3 kids and there was lots of room to get comfortable. The adults were also relieved to enjoy whale watching without fear of the kids experiencing sea sickness (no problems there!) – thanks to the protection of Fraser Island, the water conditions tend to be calmer in Hervey Bay compared to whale watching in the open ocean. I have to say that we were in for a real treat!! 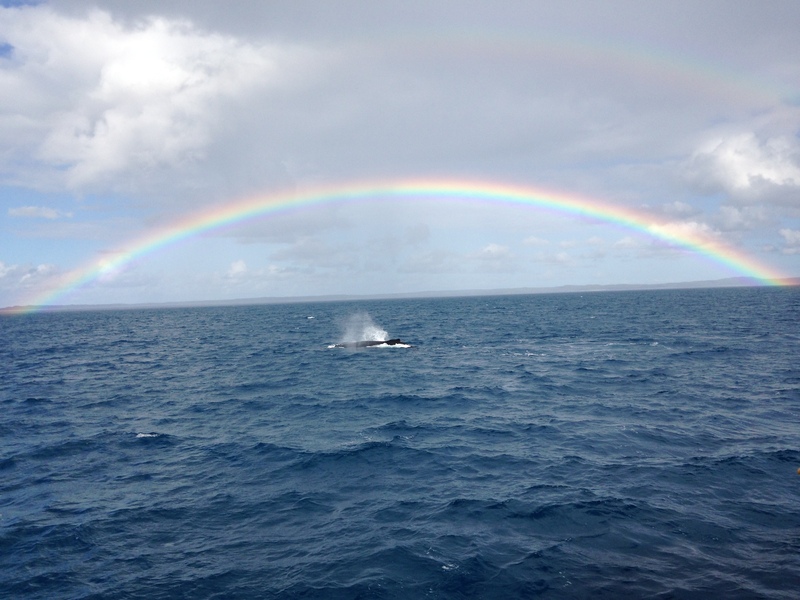 Not only did we see heaps of whales but we also witnessed the most amazing rainbow I have ever seen in my life. The girls had an absolute ball. We got to witness a whale popping its head up before splashing back down into the water – otherwise known as spy hopping! There was lots of fluke/tail slapping and fin flapping on the surface. Mums and bubs were everywhere swimming around together. And above was a pretty special moment that my husband found fascinating and amazing. The mother humpback whale was feeding her calf. For about 5-10 minutes the mother whale was vertical, facing downwards with her head resting on the bottom and fluke out of the water as her baby calf fed. After about 10 minutes when the calf finished feeding both mum and bub swam towards the boat, turned upside down and went under the boat. It was pretty darn amazing to witness. As it turns out, Hervey Bay is a very important stopover for the social development of young humpbacks. This is demonstrated by the sheer number of mothers who use the bay, a safe haven south of the principal breeding area (Cairns to Mackay), to teach calves essential survival skills in preparation for the deeper, colder waters of Antarctica. Whale watching is one of those things that you have to do at some point in your life. Seeing such gigantic and gentle creatures swimming around freely in the wild is mind blowing, and Hervey Bay is a must visit – a one of a kind whale watching destination. Another pretty amazing thing is that in August 2014, select Hervey Bay whale watching operators started offering one of the world’s first immersive humpback experiences. For the first time, people will be able to venture into the water with the whales and immerse themselves in their world. How awesome and a little nerve-wracking would it be to stare into the eye of a humpback underwater haha?